New USA Funding Reviews - Legit or Scam? New USA Funding Reviews – Legit or Scam? 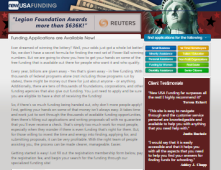 New USA Funding, found online at NewUSAFunding.com, is a website and organization that says they can help people get access to the millions of dollars in funding available through the US government and private foundations across the country. According to their website, there are thousands of federal programs, state programs, foundations, corporations, and other funding agencies that will provide funding for all different kinds of reasons and all different kinds of people. This company says they can show you “how to get your hands on some of the free funding that is available,” for the small fee of just $29.95, which they say is the smallest fee they can charge to cover their administrative costs. Besides the administration fee, users will be asked to fill out a basic questionnaire that will help their teams assess what funds they may qualify for, if they qualify at all. To begin with, you’ll have to categorize what type of funding you are searching for. Funding options include Business Funding, Real Estate Investing or Business, Community Funding, Education and Tuition Funding, Real Estate Home Purchase or First Time Home Buyer, Personal Assistance, and Home Repairs. To finish your application, you’ll need to answer questions regarding Citizenship, Age, Gender, the amount of money you are hoping to be funded, a description of how you plan to use the money, an explanation of you think you are an ideal candidate for funding, and your contact information. This is an important question to ask, as there are many unethical companies out there that charge fees for promising to help people try and receive government funds, which the vast majority of people will never actually qualify for. New USA Funding tries to prove that their services are ethical by giving their users a guarantee, saying that they will refund the $29.95 administrative fee to anyone who was denied funding, if they provide them with the information of the funding agency you applied to, the response you received, and the application you gave them. Unfortunately there have been complaints filed that this company has difficulty honoring this guarantee, often making members wait weeks for even a basic response saying that their refund request was received. Because of this, people should only feel comfortable using this service if they are ok with losing their registration fee. New USA Funding Reviews ? Average Rating for " New USA Funding Reviews " is 1.68 out of 5 based on 41 reviews. This is a complete scam!! I have called to have them stop taking money out of my checking account every month and can not get an answer from anyone on the number 888-364-1120. Does anyone have any information that will help me? It is basically a library center of sources. BUT i did not agree or aware that it was going to be a recurring charges!! When I signed up and agree to pay for the first time, it does not state ANYWHERE it is ongoing charges. SCAM SCAM SCAM!! Stay away! can' get in touch with anyone, have asked for my money back. I'm so upset I got charged for a service I didn't even use how do I get my money back . It's a complete scam. Any of the grants listed on their website, takes you to the generic company website with no info on how to apply for grants. I phoned 6-7 of them, and was told there was no such grant. It's been a total waste of 60$ for me registering with them. Almost every comment I read about this company is sooo true!!! They are a complete scam and do not offer the type of assistance they claim they will. Not only did they take my 29.95 but they also charged me an additional 30 dollars with absolutely no help of getting a grant. They have every excuse under the sun to why they can not give a refund! This was my first and last time doing anything like this .Its a COMPLETE SCAAAAAAMMMMM !!!! try 1 888 364 1120 and push 0 to try to speak to a live person. Extention 124 Joe Sparks has never returned my call. REVIEWS ON THE NET ALL DECLARE THIS SITE TO BE A RIPP-OFF FRAUD.. THE REASON THEY DO NOT ANSWER IS BECAUSE THEY ARE CON-ARTIST. REPORT THEM TO FEDERAL GOVERNMENT AGENTS, F.B.I. ETC. ALWAYS GO TO ASK.COM..TYPE YOUR QUESTION, YOU WILL GET LEGIT ANSWERS TO MOST ANY QUESTION. Gave a deposit never heard a word about anything. I suppose I should feel comfort in the fact that it only cost thirty dollars to get rid of a piece of crap.